If you're told to get off someone else's property or to leave a building because you don't have permission to be there, you're possibly committing criminal trespassing. 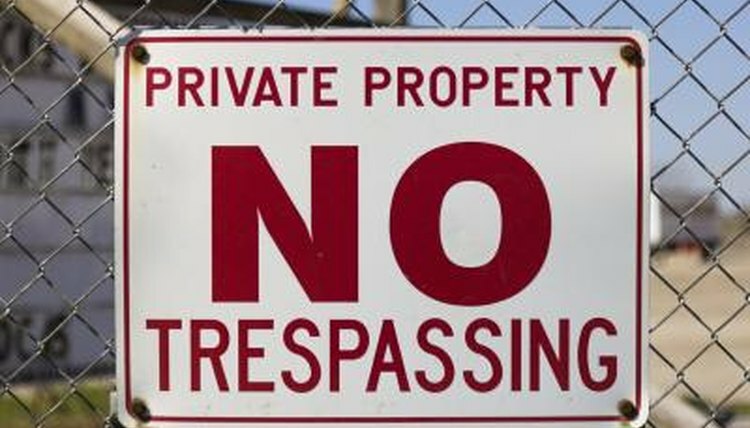 While a properly posted "No Trespassing" sign gives notice that the property is off-limits to those without permission to enter, you must also leave if the owner or an authorized person tells you to go. Whether you feel you have the right to remain is irrelevant -- that's the court's decision. Criminal trespass laws and penalties vary by state. In most, trespass is simply a matter of staying on a property after being told to leave. Even if the property isn't posted with a "No Trespassing" notice, fencing or similar enclosures can indicate that the property is private. Criminal trespass offenses are usually misdemeanors and can include fines and jail time. If you knew you weren't supposed to enter a building but did so anyway, that constitutes criminal trespassing of the first degree in some jurisdictions. Entering private real estate, but not a building, could carry a second-degree trespassing charge. In Ohio, for example, criminal trespass involving a snowmobile or off-road vehicle can result in a doubling of applicable fines, along with vehicle impoundment. Criminal trespass only applies to property or buildings, not unauthorized entry into motor vehicles, which is a different crime. Meggitt, Jane. "What Is Criminal Trespassing?" , https://legalbeagle.com/5017334-criminal-trespassing.html. Accessed 20 April 2019.